Is Working From Home Really More Flexible? 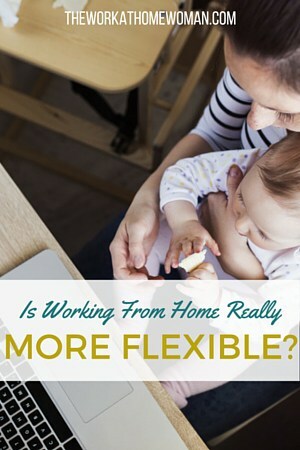 You are here: Home / Work at Home / Is Working From Home Really More Flexible? 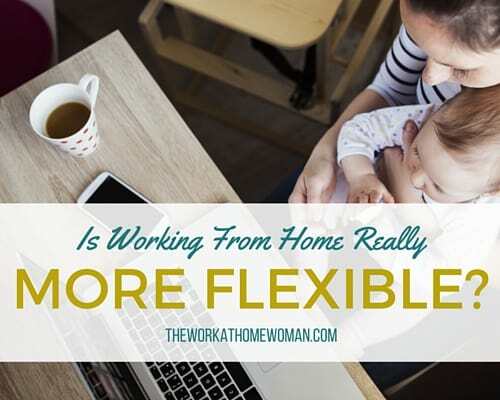 Many of us seek work-from-home employment or start our own business because we want more flexibility. We want the ability to work the hours we choose, be with our children when we want and take care of our personal and family needs while we work. There are many scenarios that can upset this ultimate work-life balance that we all seem to seek. In many cases, women don’t just want to work; they need to work. Their families rely on their income to help support their needs and wants. When a woman decides that she wants to start her own business, this is sometimes hindered by the family’s needs. She may not be able to afford to quit her existing job to launch her venture. The family may not be able to simply absorb the start-up costs and the difference in pay that she may experience. A lot of women entrepreneurs start their businesses while they continue to work either full or part-time. This can cause the business to get off the ground more slowly. It can also be overwhelming for the woman who decided to start the business because she wanted more flexibility when in actuality it’s causing her to spend even less time with her family. The workload can become unbearable. Women who are balancing a job, a business and a family tend to be even more stressed. They are pulled in even more directions and have a more difficult time balancing family with different work and business responsibilities. Even if you can transition completely to entrepreneurship and leave your old job behind, there can still be an enormous amount of work in starting and running your own business. Many entrepreneurs put in hour after hour to ensure that everything is done. They don’t often have the extra cash flow to hire help and do a lot of the legwork themselves. This, too, can take time away from their families and personal interests. Another common struggle for those who work from home seems to be separation. I think we struggle to carve out the time for work, versus the time for family, and they often are not clearly defined. They blur together, and it becomes difficult to separate work from home when they are both happening at the same place. This can cause overworking and that tremendous workload that we talked about earlier. But, it can also cause a lack of work and a decrease in income like we also mentioned before. So, what’s a woman to do? How can we have our cake and eat it too? When you make the decision to work from home, have a clear plan about how much you will work, what the income expectations are (realistically) and how your children's or family's needs will be cared for while you’re working. Write it out in black and white. That doesn’t mean your plan can’t change, but it’s much easier to follow an outlined plan than one that doesn’t exist. Second, don’t bite off more than you can chew. Families and homes are demanding, as are jobs. We are not superheroes. Our workloads and expectations for ourselves cannot be completely out of whack, or we will be setting ourselves up for failure from the beginning. If you are transitioning from not working at all, start out slowly. If you are starting your own business, create a strong business plan, and research the steps, it will take to get you where you want to be. Again, take steps to get there, and get used to the water first, so to speak. Third, have a designated work space and dedicated work times. Don’t allow your work to bleed into your family time and vice versa. This can be very challenging but do your best. Leave your phone, tablet, computer, etc. in your workspace. Visit it only when it’s planned work time. Have a plan for child care so that you are not repeatedly interrupted when it is work time. Do your absolute best to separate. And, lastly, enjoy! It is a privilege and a benefit to be able to work from home. It isn’t always easy, but most things in life worth having are not. Organization and planning are your best defenses against an unhappy self-employment. How do you manage your work-from-home-life? We’d love to hear about it! Dawn Berryman is the founder of MarketMommy.com and Market Mommy: The Blog, an online marketing resource for mom entrepreneurs. Market Mommy shows moms how and where to market their businesses. She holds a B.A. from Indiana University and has worked in the marketing/communications field for more than 11 years. She resides in rural Ohio with her husband and three children. For more information, please see Market Mommy.